Have you ever priced single Calla lilies at a florist? If you have, you will have discovered that they sell for $5-$9 a STEM. Why pay those kind of prices, when you can become your own florist – well sort of, anyway. 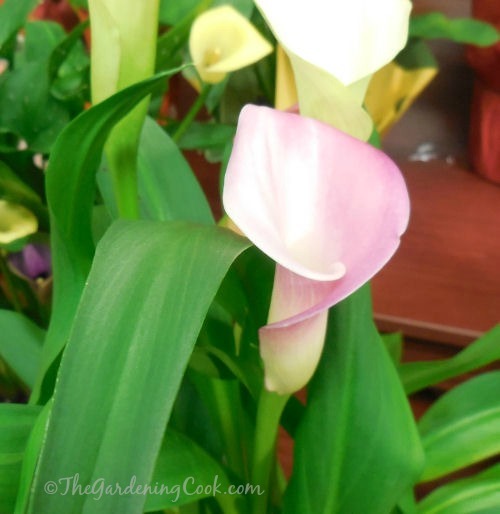 Calla Lilies make wonderful indoor plants and comes in many colors, as well. If you love to grow flowering houseplants, especially those with dramatic blooms, calla lilies are a great choice. Calla lilies are easy to grow and produce gorgeous long stemmed flowers in a wide range of colors. They are a favorite with florists, particularly when white, because they are popular for weddings. It’s hard to believe that something that grows from an ugly rhizome can produce such a gorgeous display! To start, you will need a plant or a single rhizome. (See my article to help understand the differences between bulbs, corms, rhizomes and tubers.) 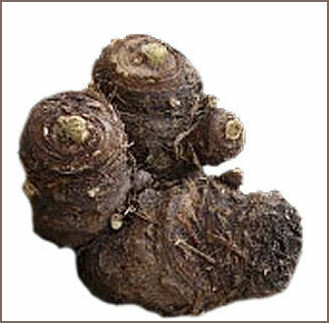 Good quality calla lily tubers can cost about $6 each. So for the cost of a single flower at the florist, you can grow the tubers that will give you up to a dozen flowers. Here are some growing tips to get the most out of you calla lily rhizome. If your plant came in a pot, check to see if there is more than one rhizome in it. Many nurseries use smaller tubers and plant several to a pot. You can separate them and give them more room to grow or replant into several pots for a better display. Plant after all danger of frost has passed. They should be planted about 3 inches deep with the growing tip facing up. Callas like average to moist soil conditions but not soggy soil. Be sure not to let them be dry for too long. After blooming, don’t cut the foliage off. Like most bulbs, the leaves will continue to gather sunlight and provide nourishment for next year’s display. You can remove the leaves when they turn yellow. Propagation of calla lilies can be done two ways – by rhizomes and by seeds. The easiest way is to divide the rhizomes making sure each has roots and eyes attached. Calla lilies make great house plants. They need bright light and a pot that gives them room to grow. Hold off watering in the winter when the plant is dormant but you can leave the rhizomes in the pot. Growing calla lilies from seed can be a challenge but it is possible. Each of the flowers has seeds that are made internally. When the flowering has finished, the flowers will close up to encase the seed pods. Save the whole flower head and cut it off the plant before frost occurs. 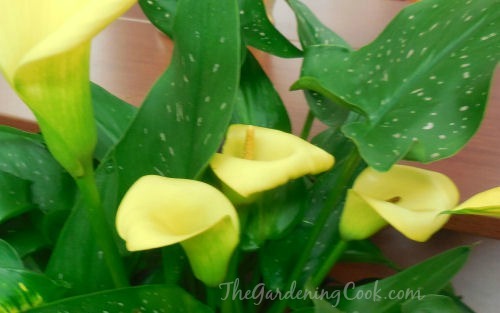 Here is a great YouTube video showing how to use the seeds pods for new Calla Lilies. The man who made the video has many showing how to collect seeds from Calla Lilies. I received some cala Lillys for Easter and was wondering if they can be planted outside? They’re starting to wilt and die now. I live in N.H. I received Calla Lillies in a pot for Mother’s Day (live in N.J.). Flowers are gone but the greens have not wilted. Will the greens remain green over the winter and bloom again in the spring. Hello Frances. Calla Lilies are tropical plants and only hardy in zones 8-10 which is much more south than NJ, so they will likely not come back next year. I live in Illinois and recently purchased a calla Lilly as a houseplant. Is this something that will last year round and what kind of care will it need?